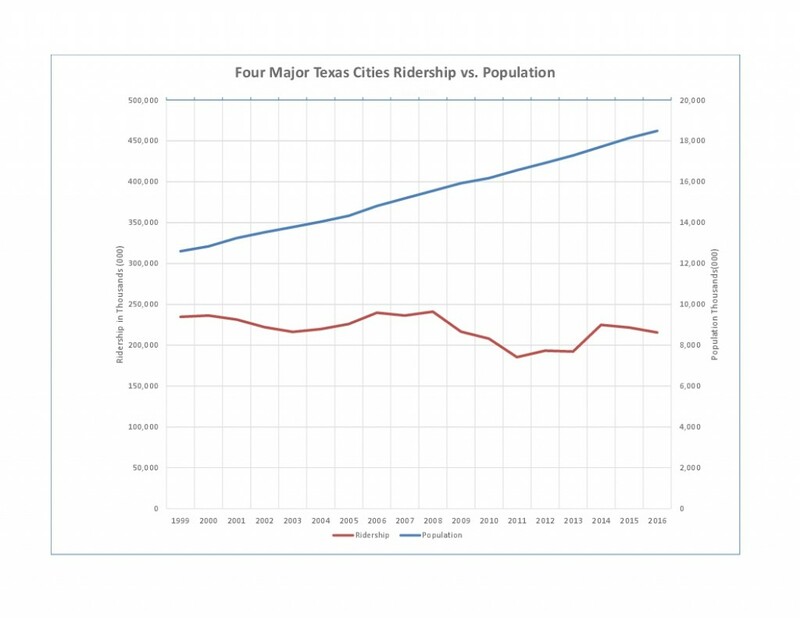 COST Commentary: Below are three charts with convincing data as to the huge degradation and failure of public transit in Austin, Dallas, Houston and San Antonio, the four major Texas cities. This is consistent with other major U.S. city regions, similar to these Texas city regions. Note: The term city in this posting includes the Metropolitan Statistical Area (MSA) for each city. Below the charts is a confirming article by Joel Kotkin published in The Autonomous Future magazine relating national trends which confirm COST Commentary below. This story will be extended in the near future. We thought it important to post this important key information now. 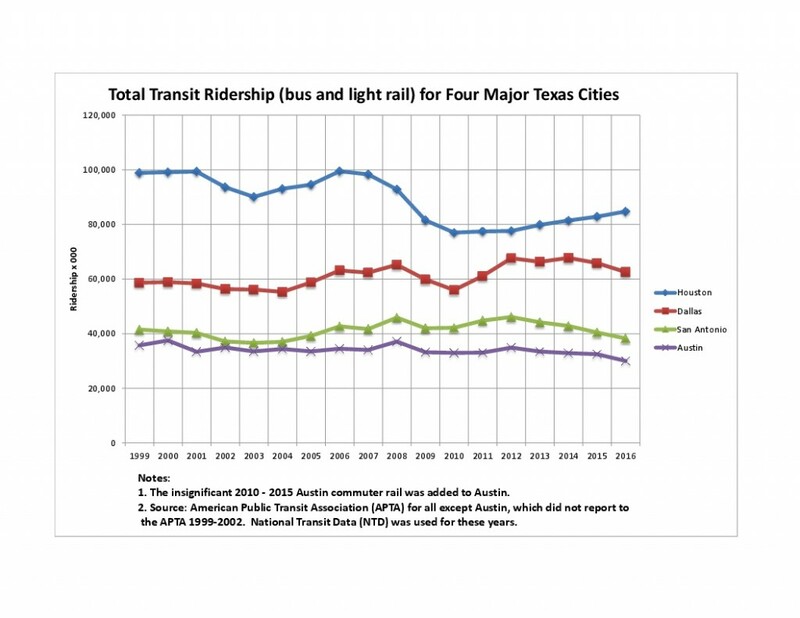 The first chart displays the total bus and light rail ridership in each of the four major Texas regions. As shown, the total bus and light rail ridership in 2016 is less than in 1999, 17 years ago. This was prior to the introduction of significant light rail which mostly occurred in the second half of this chart, primarily in Dallas with the longest light rail system in the nation and in Houston with much less rail. Austin has a small commuter rail with insignificant ridership included in the Austin data. San Antonio remains the most cost-effective system and has no rail transit. The total 8% reduction in transit ridership occurs during a period when the average growth of the population of these cities was 47%. Austin was the poorest performing city in that its ridership reduction is 16%, double the average of the four cities, and Austin’s population growth of 71% was significantly greater than the other cities. The second chart depicts the population trend of the four cities over this same time period. Growth continues to be very consistent. The third chart shows the total ridership and total population of the four cities during the period. These data present very poor performance of the cost and effectiveness of the past and current approach to public transit and mobility in general. These cities have spent many billions of dollars to increase public transit ridership and have all failed at the great expense of all taxpayers. Public transit has declined as an adequate mobility alternative for those who have no alternative and it serves few who do have an alternative. The wasted expenditure of billions of dollars has also decreased available funds needed to address true mobility improvements for the vast majority including private, shared, public transit, commercial, emergency, school, government, etc. vehicles which provide mobility encompassing about 99% of daily passenger miles in these regions. As an example of Austin’s misguided mobility approach, the City proposed a second light light rail in 2014 which was touted to remove 10,000 cars from the highways and cost $1.4 billion. Both of these estimates are highly optimistic, likely fewer cars removed and much higher rail costs. As a comparison: Three major, recent road improvements, including MoPac, 290 East and 183A, have a combined cost (in current dollars) about the same as this 9.5 mile, dual track (19 track miles) rail. However, these improved roads create approximately 135 new toll and non-toll road lane miles and greatly relieve traffic on parallel, major existing lanes of almost 160 miles. This significantly improves the daily transportation/mobility of more than 500,000 people whether they choose the toll road/lanes or the non-tolled lanes/roadways. The capacity of these new road lanes provides the ability to better serve more than 700,000 daily travelers in the future and will be much greater capacity for the approaching driverless vehicle era. This is cost-effective mobility, resulting in greater quality-of-life for most. 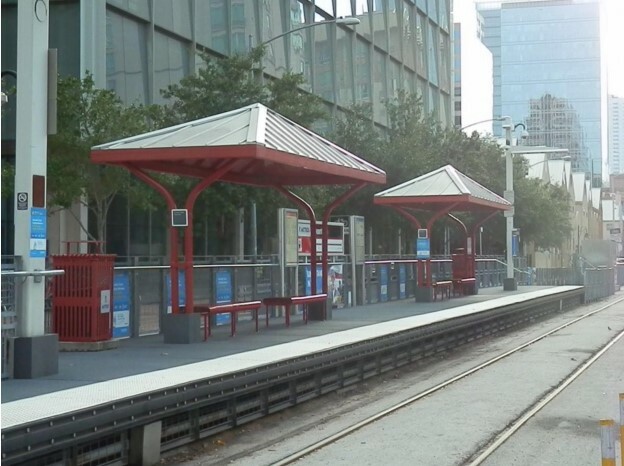 Following the voters defeat of light rail in 2014, the Austin City Council presented voters a $720 million, so called, transportation bond referendum in 2016. This referendum was one of the most deceptive and destructive referendums in history. The City’s distortions and deceptions resulted in voters passing this largest transportation bond in Austin’s history. While presented to improve mobility, it is highly likely to degrade mobility and increase congestion for a majority of those affected by the bond. More than one-half of the bond’s funds are for projects which have a negative impact on motor vehicles using the streets. Several vehicle lanes will be removed in favor of increased, wider bicycle lanes and dedicated bus lanes to serve Austin’s declining transit ridership. In addition there are bicycle and pedestrian trails, and sidewalks which are disproportionately higher costs compared to the number of bike riders and pedestrians using them. The answer for the self-serving few seems to be: If we build much more, the use will increase. Meanwhile, all taxpayers highly subsidize these, mostly, non-mobility projects while reducing their own mobility on the roads. Contrary to Cap Metro and Austin City rhetoric, public transit and congestion are not strongly related. The number of people using transit is so small, and reducing for 20 years, that it has almost no impact on road congestion. However, better roads, including the use of toll roads and “managed” toll lanes will significantly improve public transit, providing improved mobility to those without alternatives and those who chose to use transit as an alternative. We are proud of the key role COST played in the voters’ defeat of the two rail referendums in 2000 and 2014, saving taxpayers billions of wasted dollars on long outdated technology and preventing even greater congestion. These ill-advised rail proposals by Austin and Cap Metro leaders were not overall transit or mobility improvements. There are no cities in the nation, similar to Austin, which provide a success example for these outdated rail systems. Perhaps the greatest failing of our mobility planners is to propose these rail “mass transit” approaches and ignore the reality of rapidly advancing transportation/mobility technology. The Uber/Lyft revolution and the introduction of driverless vehicles, by Google and others, is predicted by almost all to further reduce the use of public transit and increase the capacity of current roadways. One of the key positive aspects of the light rail defeats is that is it has forced Capital Metro to to focus more of its resources on improving bus transit to increase mobility for a greater portion of citizens needing this alternative. Time will reveal their success. Disappointingly, Cap Metro has ignored evaluating Cellular Mass Transit (CMT) conceptsas a major step in Transit Efficiency and Cost-Effectiveness. CMT is a locally developed bus transit concept over more than 20 years and based on several of the most successful transit approaches implemented throughout the world. CMT concepts would utilize the existing bus system better using a customer demand driven approach rather than a scheduled route system. CMT combines buses with vans and taxis to serve the entire community with 10 minute maximum wait times and twice as fast trip times which offer the possibility to dramatically increase ridership, resulting in reducing taxpayer subsidies. It can be implemented for a fraction of the capital and operating costs taxpayers will pay for any Light Rail system and for Cap Metro’s current overall systems approach. The CMT concept deserves serious consideration as a replacement for major portions of Austin’s/Cap Metro’s public transit system. Sadly, major segments of our misguided transportation leadership have continued to promote mobility approaches which are contrary to citizens’ needs as reflected in their daily mobility decisions. The current ‘Draft Austin Street Design Guide’ reflects this fundamental disconnect with citizens with an obvious, shallow “social engineering” objective. Page 9 states Downtown is a Special District and that: “The model hierarchy is pedestrian first, then bicycle and transit, then vehicles.” This fourth priority for vehicles will continue to degrade downtown as a desirable destination for citizens and will degrade the quality-of-life for most. The priority mobility needs for downtown should be safety, ease of access and available, affordable parking. This is a strong characteristic of the Domain which already exceeds downtown Austin as a thriving commercial center. Austin’s current ‘Imagine Austin,’ ‘draft Street Design Guide,’ ‘Code Next draft,’ etc.’ require extensive re-evaluations to support the greater-good of the entire city and its citizens’ needs and rights to better quality-of-life. Why is mobility vital? Because better mobility is directly related to better quality-of-life as it has been for thousands of years. Citizens need and deserve this recognition in the design and implementation of mobility infrastructure. They do not need the extension of a long era of ill-contrived, social engineering intended to change people’s habits and decisions regarding their quality-of-life needs, including mobility. Citizens are far better judges of their needs than inexperienced elected officials and their hired hands who have allowed our mobility to continue to degrade so significantly. The proportion of the labor force working from home continues to grow. Expanding mass-transit systems is a pillar of green and “new urbanist” thinking, but with few exceptions, the idea of ever-larger numbers of people commuting into an urban core ignores a major shift in the labor economy: more people are working from home. True, in a handful of large metropolitan regions—what we might call “legacy cities”—trains and buses remain essential. This is particularly true of New York, which accounts for a remarkable 43 percent of the nation’s mass-transit commuters, and of other venerable cities, such as San Francisco, Washington, Boston, Philadelphia, and Chicago. Together, these metros account for 56 percent of all mass-transit commuting. But for most of the rest of the country, transit use—despite often-massive infrastructure investment—has either stagnated or declined. Among the 21 metropolitan areas that have opened substantially new urban-rail systems since 1970, mass transit’s share of work trips has declined, on average, from 5.3 percent to 5 percent. During the same period, the drive-alone share of work trips, notes demographer Wendell Cox, has risen from 71.9 percent to 76.1 percent. Meantime, the proportion of the labor force working from home continues to grow. In 1980, 2.3 percent of workers performed their duties primarily at home; by 2015, this figure had doubled to 4.6 percent, only slightly behind the proportion of people who commute via mass transit. In legacy core–metropolitan statistical areas (MSAs), the number of people working from home is nearly half that of those commuting by transit. In the 47 MSAs without legacy cores, according to the American Community Survey, the number of people working from home was nearly 250 percent higher than people going to work on trains or buses. The areas with the thickest presence of telecommuters—including cities such as Austin, Raleigh-Durham, San Diego, Denver, and Seattle—tend to have the greatest concentration of tech-related industries, which function well with off-site workers. In San Jose, the epicenter of the nation’s tech industry, 4.6 percent of people work from home, exceeding the 3.4 percent who take mass transit. Other telecommuting hot spots include college towns like Boulder, where over 11.6 percent of workers work from home, and Berkeley, where the share is 10.6 percent. Leading telecommuting centers tend to be home to many well-educated, older, and wealthy residents. Communities such as San Clemente, Newport Beach, and Encinitas in Southern California, as well as Boca Raton in Florida, all have telecommuting shares over 10 percent. Perhaps older, well-connected people are more inclined to avoid miserable commutes, given the chance to do so. As the American population skews older, the economy will likely see more workers making such choices. Another important demographic force contributing to the work-from-home inclination is Americans’ continuing move to lower-density cities, which usually lack effective transit, and to the suburbs and exurbs—where 81 percent of job growth occurred between 2010 and 2014. While most metropolitan regions can be called “polycentric,” they are actually better described as “dispersed,” with central business districts (CBDs) and suburban centers (subcenters) now accounting for only a minority of employment. By 2000, more than three-quarters of all employment in metropolitan areas with populations higher than 1 million was outside CBDs and subcenters. Home-based work could be the logical extension of this dispersal—and modern technologies, from ride-sharing services to automated cars, will probably accelerate the trend. A recent report by the global consulting firm Bain suggested that greater decentralization is likely in the coming decades. A 2015 National League of Cities report observes that traditional nine-to-five jobs are on the decline and that many white-collar jobs will involve office-sharing and telecommuting in the future. The report also predicts that more workers will act as “contractors,” taking on multiple positions at once. Some see these developments as ominous, but greens and urbanists shouldn’t: telecommuting will, among other things, reduce pollution. It may be that the shift to home-based work will prove the ultimate in mixed use—albeit for workers in their pajamas. Joel Kotkin is the presidential fellow in urban futures at Chapman University and executive director of the Center for Opportunity Urbanism. Large Taxpayer Transit Subsidies Fail to Increase U.S. Ridership. COST Commentary: Austin area’s annual transit trips of about 17.4 million per person in the urban population is on the low end of regional trips in the U.S. Austin has well under one-half of the average trips/person in all U.S. Urban Areas which have a combined, near historical low, average annual transit trips of 41 per urban population in 2015. 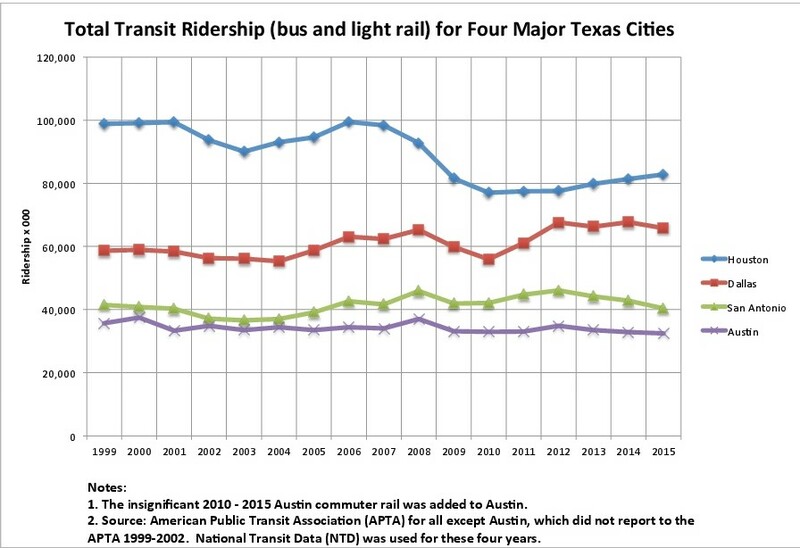 The Austin Urban Area has been in a declining transit trip trend and is currently at an all-time low in transit trips per person and in actual total transit trips over the past 18 years. During this period the urban population has grown almost 50% and more than a billion tax dollars have been spent to increase transit ridership. Following implementation of the MetroRail ‘Red Line’ Commuter Rail, total transit ridership has continued to drop. Dallas and Houston experiences are similar to Austin, but transit investment has been much higher in these two major Texas cities. They have spent many billions of tax dollars attempting to increase transit ridership including Dallas’ investment in the longest light rail system in the nation. Both cities have experienced declining transit ridership per urban area population and Houston experienced a major drop in total transit ridership when they implemented their first light rail line. Dallas has been essentially flat in transit ridership for many years while its population has grown significantly. Taken for a ride: Don’t buy the claims of record transit ridership, Randal O’Toole writes in NewGeography: “America’s urban population more than doubled between 1956 and 2014. Using the ridership number that really counts – trips per urban resident – 2014’s number was a near-record low of 41 trips per person.” Despite increasing, massive subsidies, the general ridership trend is downward. “To a large degree, this downward trend is because the subsidies have made transit agencies more responsive to politics than transit riders,” O’Toole points out. COST Commentary:The Austin region was a leader in the decline of transit ridership throughout the United States, from 2015 to 2016. Austin declined in both rail and bus transit ridership with a total drop of more than 7%, about three times the average national decrease. Austin has been on an almost 20 year declining ridership trend while population has increased approximately 70%. Austin transit ridership has declined faster in recent years. The article below has more detail regarding the U.S. ridership decline. Cap Metro and the City of Austin seem to be avoiding any attempt to provide plausible explanations as why they continue to spend hugely disproportionate levels of taxpayer funds for current and long term transit infrastructure to serve a declining number of riders. This policy is clearly to the detriment of improving roadways for drivers of private vehicles as well as commercial, government, emergency and transit vehicles. This long-term mismatch between the spending of tax funds and the mobility needs of citizens, as expressed by their choices of transportation, continues to increase roadway congestion with resultant degrading of our citizens’ quality-of-life. The $720 million transportation bond passed by Austin voters last year has about two-thirds earmarked for transit, bicycle and walking infrastructure. It was deceptively presented as roadway “congestion relief,” but, it will increase congestion on its several central Austin “corridor” roadways, and surrounding areas, as it reduces driving lanes/capacity and increases transit, biking and walking infrastructure. Only about 20% of the bond package is designated to improve mobility and reduce congestion on a small number of roadways. It is discouraging that our elected officials, mostly inexperienced in the leadership roles they are in, loose site of the fact that they are elected to serve the greater good of the overall community and not their own perceptions, ideologies and self interests. Their job is too provide the most effective support for citizens’ choices which are intelligently made to provide their desired quality-of-life. Priorities for taxpayer mobility funds should be based on this user demand. Providing “alternative” transportation under the policy that “we need it all” is irresponsible and unsustainable. There is not enough tax money in the region to do this and not enough users of “alternative transportation” to support such policies. The major purpose of transit should be to provide cost-effective mobility to those who have no alternative. Unfortunately, too many misguided and inexperienced transit and elected officials follow a path of attempting to “social engineer” changes in peoples desires and decisions because they believe they know how people should live, better than the people themselves. Wrong!! Why Americans don’t ride transit: Too Slow, Limited Destinations, Expensive, Weak Security, Cities Not Built For It. COST Note: The data in the article below are for the 2016 full year. With little fanfare, the American Public Transportation Association (APTA) released its fourth quarter 2016 ridership report last week. When ridership goes up, the lobby group usually issues a big press release ballyhooing the importance of transit (and transit subsidies). But 2016 ridership fell, so there was no press release. The report showed that light-rail ridership grew by 3.4 percent, probably because of the opening of new light-rail lines such as Seattle, where the opening of the University line increased ridership by 60 percent. In the past, light-rail ridership has grown with the addition of new lines, but the number of passengers per mile of light rail has fallen, indicating diminishing returns to new rail construction. Commuter-rail ridership grew by 1.6 percent, mostly due to growth in New York City. Trolley bus ridership grew by 1.8 percent, almost all of which was in San Francisco. Demand-response (paratransit) grew by 0.7 percent. The two most important modes, however, both declined: heavy rail fell by 1.6% and buses by 4.1 percent. Since these two modes together carry 86 percent of transit riders, their decline swamped the growth in other modes. “Other,” which includes ferries, monorails, and people movers, also fell by 0.2 percent. In some cases, the decline in bus ridership more than made up for increases in rail ridership. Phoenix light-rail ridership grew by 10.6 percent, but for every light-rail rider gained, Phoenix transit lost nearly four bus riders. Los Angeles light-rail ridership grew by 8.7 percent, but for every light-rail rider gained, Los Angeles lost nearly six bus riders. Ridership on Nashville’s Music City Star grew by 2.6 percent, but the city lost more than 30 bus riders for every new rail rider. Denver opened a new rail line to the airport but lost more than 1-1/2 bus riders for every rail rider gained. Charlotte lost more than 15 bus riders per new rail rider, while Portland lost nearly 2 bus riders per new light-rail rider. Salt Lake City has been getting more federal transit funding per capita than any other urban area, but the region seems to be losing its bet on light rail and commuter rail. Except for paratransit, every mode of transit in the region declined. The same thing happened in Dallas-Ft. Worth, which has built more light rail than any region in the country. Transit in San Jose, home of one of the nation’s worst-managed transit agencies, took a real nosedive, losing 10.0 percent of light-rail riders and 8.5 percent of bus riders. APTA will no doubt blame these declines on low gasoline prices. 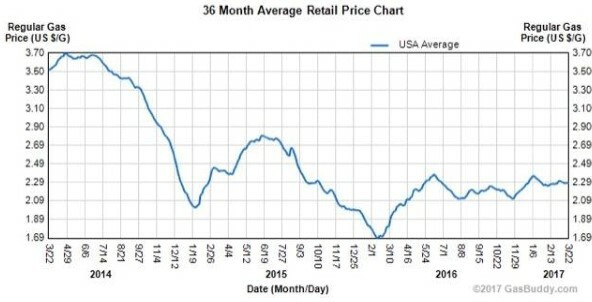 Prices for regular gasoline in 2016 averaged $2.14, about 12 percent less than 2015’s $2.43. Prices in 2016 were also less variable, which might have given people more confidence in driving. Perhaps more important, per capita incomes grew by 3.5 percent, which probably contributed more to near-record auto sales than low gas prices (though the low fuel prices influenced people’s choices of what vehicles to buy). The transit industry bills itself as providing necessary transportation for low-income riders and alternative transportation for choice riders. Whether because of low gas prices, rising incomes, or growing shared-car services, low-income commuters are buying cars and higher-income travelers are making a choice not to use transit. In the face of these choices, transit agencies that want to spend hundreds of millions or billions on fixed-guideway transit, either rail or dedicated bus lanes, are wasting peoples’ money. COST Commentary: The article below addresses the myth that there is a behavioral change in younger people which indicates a shift away from car driving to increased walking, biking and transit. This behavioral change is promoted from time to time by anti-car factions as support for increasing walking, biking and transit infrastructure. However, in every case, the change is exaggerated and not supported by facts. The sad and true facts are that we in Austin are spending a far greater percentage of transportation funds on the minuscule contribution of walking, biking and transit than to the overwhelming chosen transportation choice of driving. This results in continuing increases to roadway congestion. At least 99% if our regions daily passenger miles are on the roads. The Austin region has a 20 year trend of declining transit use during a period which experienced a 70% population growth. This is a very convincing “survey” of the choice of regional citizens. Yet, with this strong affirmation of citizens’ transportation preference, elected leaders of Austin have continued to focus a majority of transportation funds on declining modes, resulting in increasing congestion on roadways and decreasing the quality of life of the vast majority of citizens. This ill-advised policy is, and will continue, degrading the desirability of citizens to work in and travel to Central Austin. by Robert W. Poole, Jr., Director of Transportation Policy, Reason Foundation, Published in “Surface Transportation Innovations”, Issue 162, April 2017. The Federal Highway Administration in late February released its latest Traffic Volume Trends report, finding that vehicle miles of travel (VMT) increased 2.9% in 2016, to a near-record 3.2 trillion miles. Even more surprising, VMT per capita continued the uptrend that began in 2014. The 2016 figure is 10,065 miles per capita, just a bit less than the all-time high of 10, 117 mi./person recorded in 2004. Eno Transportation Weekly’s Jeff Davis reported (Feb. 20, 2017) that growth in VMT/person over the last three years has averaged 1.7% per year, which exceeds the 13-year trend (1992-2004) of 1.3% per year. These results call into question the widely discussed notion, popularized by anti-car groups like the Public Interest Research Group (PIRG), that fundamental behavioral changes were at work, with an attitudinal shift away from car culture, especially among Millennials, and a shift from driving to biking and walking. I questioned that hypothesis at the time, and a recent study in the Journal of the American Planning Association bears me out. Their paper goes into details on their analysis, which I’m omitting here. But several of their findings on “little evidence of mode shift” are worth noting. •	Walking: They reviewed data showing that between 2002 and 2013 the share of Americans who walk regularly did not increase. Moreover, over 60% of walking trips were for exercise, recreation, or dog walking, which are not substitutes for driving. •	Biking: Bike trips per capita peaked in the 1970s, and between 2001 and 2009, biking’s share of all trips increased marginally, from 0.9% to 1.0%. Sales of bikes dropped, from 67 per thousand people in 2005 to 57 per thousand in 2014. And because most are short, few bike trips can replace driving. 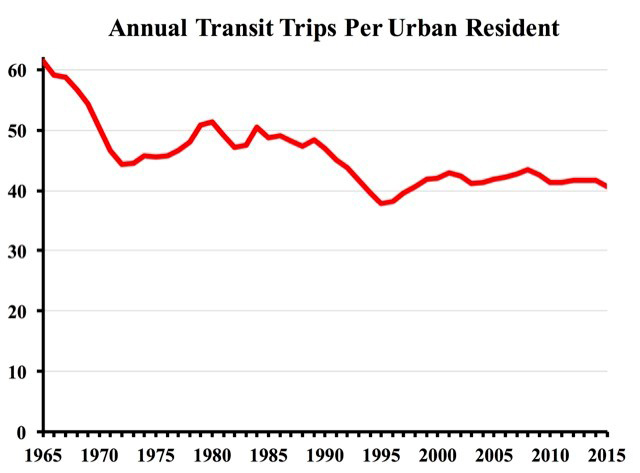 •	Transit: The supply of transit, as measured by vehicle hours of service, has tripled since 1970, and that expansion continued during the driving downturn. But this did not result in much additional ridership. Americans took 0.65 transit trips per person per week in 2012, up from 0.64 in 2004. And those numbers are little different from earlier years: 0.64 in 2000, 0.68 in 1990, 0.72 in 1980, and 0.68 in 1970. Despite what all of these numbers show, I continue to read articles and hear presentations by transportation planners who are stuck in the “peak car” frame of reference, implying that their job going forward is to devote more resources to transit, biking, and walking and less to roads and highways. The facts clearly argue against that hypothesis; there are no “alternative facts” that justify making such plans. COST Commentary: O’Toole’s five brief articles, below, certainly relate to Austin and the three other major Texas Cities/Regions. Total transit ridership in Austin is less today than 18 years ago while the region’s population has grown 66% during this period. With this trend, one would logically assume those in charge of Capital Metro and the City of Austin would adjust their thinking regarding the best way to address Austin’s reducing quality-of-life due to increasing congestion in the region. But no, Capital Metro and the City are doubling down on their failed transportation strategies over many years. The City is working diligently with a plan to spend many hundreds of millions of tax dollars to increase public transit, bike and shared vehicle ridership. Capital Metro is spending almost a hundred million dollars to upgrade their poor performing commuter rail with new track and vehicles which will allow more frequent train trips. These transit and bike upgrades will actually result in increased congestion on the streets as plans will reduce capacities on numerous streets for the 99 plus percent of travelers who use motorized vehicles on streets. Several street corridors in the City’s $720 million bond package, last November, will replace car lanes with dedicated (totally or in peak hours) bus lanes. These follow the previous failed attempts to increase transit ridership with the expenditure of hundreds of millions of tax dollars on commuter rail, a number of Bus Rapid Transit (BRT) routes and express buses. 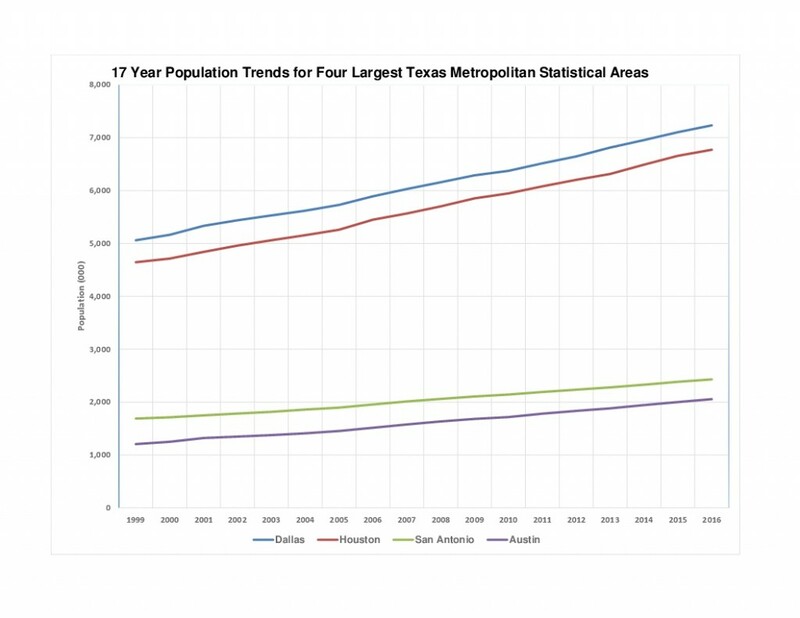 Overall, the four major Texas cities have spent several billion dollars to increase transit ridership and the total result is that the sum of these four cities have less transit ridership today than in 1999, almost eighteen years ago. While reducing road lanes in an already congested condition will exacerbate congestion, another vision in Austin’s “Imagine Austin” long range plan will also contribute to increasing congestion. This plan will significantly increase population density in Central Austin. This increased density will result in increased numbers of private vehicles, greater driving per square mile and increased congestion. It has been proven throughout the industrialized world that greater population density results in greater roadway congestion. Austin’s vision of reducing vehicle lanes and increasing population density on major central corridors will result in greater and growing congestion with less safety. Austin’s $720 million bond has $488 million dedicated to central Austin roadway corridors. To complete all of these corridors, the City estimates a cost of more than $1.5 billion based on “concept” studies and little engineering design. This “concept” estimating typically results in the real costs being much higher. Since these costs are funded by long-term bonds, taxpayers are likely to pay much more than $3 billion over the term of the bonds. This will be a dreadful, inefficient use of taxpayer funds which will degrade Austin citizens’ quality-of-life by preventing Austin’s ability to fund far greater needs, including real congestion relief, over the next 20 years. The major objective of today’s transit agencies is to “get people out of cars.” The objective should be to “provide mobility for those who do not have cars and have no alternative to public transit. These two objectives are diametrically opposed and require transit to be addressed and focused in very different parts of the community. There is not enough wealth in the region to support both objectives. In cities similar to Austin today, or 100 years from today, transit has not been demonstrated to result in major reductions in vehicle traffic on roadways. Attempting to achieve this objective, substantially reduces the ability to provide transit mobility to those with no other choice. As we look to current and future innovation and technology, transit is projected to play a reduced role in mobility. Transit agencies have, in general, not demonstrated an ability to adapt to the changing demand and future trends. As discussed earlier, Austin and the total four largest Texas cities have spent billions of dollars to increase public transit and the results have been a resounding failure due to their lack of comprehension of current and future trends in mobility. We must stop wasteful mobility spending and plan the future based on the obvious reality of today’s trends and the knowledge of future directions. This will require a very different leadership of Capital Metro and Austin transportation operations. There’s a myth that Americans have some kind of irrational love affair with their cars, and they don’t ride transit because of that irrationality. In fact, there are very good reasons why autos provide well over 95 percent of mechanized travel in urban areas while transit provides less than two percent. One of the most important reasons is that transit is slow. Most transit is slower than driving, and a lot of transit is slower than cycling. According to the American Public Transportation Association’s Public Transportation Fact Book, the average speed of rail transit is 21.5 miles per hour, while the average speed of bus transit is 14.1 mph (see page 7). So-called rapid transit, known to the Federal Transit Administration as heavy rail, averages just 21.1 mph, while light rail is 15.6 mph and streetcars are a pathetic 7.7 mph (see page 40). Among forms of rail transit, commuter rail is fastest at 32.5 mph, while hybrid rail (a form of commuter rail) is 28.0 mph. But commuter rail typically operates only during rush hours, while hybrid rail exists only in special limited circumstances. Monorails and other automated guideways average 8.8 mph, which helps explain why monorails never became popular. Commuters buses, averaging 26.0 mph, are the fastest form of bus transit, while ordinary buses are just 12.5 mph and trolley buses (which, like streetcars, tend to be limited to urban centers) are just 7.1 mph. So-called bus-rapid transit lines in this country average 10.5 mph, 2 mph less than ordinary buses, which suggests that most cities’ implementation of bus-rapid transit leaves a lot to be desired. The only really rapid transit is the form of transit that’s closest to cars: vanpools, which average more than 40 mph (see page 35 for bus and highway transit modes). By comparison, the average speed of auto travel in most American cities is more than 30 mph. The slowest city is New York, at 17.6 mph, which helps explain why New York also has the highest rate of transit usage. The only others under 20 mph are San Francisco and Washington. At the other extreme, average speeds in Kansas City and Tulsa are more than 40 mph, probably because those cities, unlike so many others, haven’t actively tried to discourage driving in a doomed effort to get people to ride transit. Taken as a whole, urban transit averages 14.1 mph, less than half the speed of driving in most cities (and slower than many cyclists). This doesn’t count the time spent getting to and from transit stops, waiting for transit vehicles, or transferring from one to another, all of which make transit even slower. Most transit is oriented to downtown, a destination few people go to anymore. If you don’t want to go downtown, transit is practically useless. This week, the Antiplanner is exploring the myth that Americans don’t ride transit because they have some kind of irrational love affair with their cars. In fact, there are very good reasons why autos provide well over 95 percent of mechanized travel in urban areas, and transit’s limited destinations is one of them. The Portland urban area, for example, has around 15,000 miles of roads and streets. The region’s 80 miles of rail transit don’t begin to reach the number of destinations that can be reached by car. Adding the roughly 1,000 miles of bus routes helps, but still requires many people to walk long distances to and from transit stops. Worse, almost all of the transit in the region, along with every other major urban area, is oriented to downtown. If you don’t want to go downtown, transit is practically worthless. For example, the Sylvania campus of Portland Community College is about seven miles from Beaverton. But taking transit from one to the other requires a trip downtown and back, nearly tripling the number of miles of travel. Transit systems started their downtown orientations in the late nineteenth century when almost all urban jobs were downtown. Today, however, only about 7.5 percent of urban jobs are still located in downtown areas. In the New York urban area, 22 percent of jobs are located in downtown Manhattan, another reason why transit ridership is high in that region. But elsewhere, the percentage is much smaller. Transit planners try to compensate for this by designing transit systems that connect regional and town centers with the downtown areas. Such a policy might have made sense sixty years ago when most jobs that weren’t downtown were located in such centers. Today, however, less than 30 percent of urban jobs are located in either downtowns or regional and town centers. The reason for the decline of regional and town centers is the growth of service jobs. In 1920, nearly 40 percent of all American jobs were in manufacturing, which tends to be concentrated, and there was just one-and-a-third service job for every manufacturing job. By 2010, there were ten service jobs for every manufacturing job, and those service jobs tend to be finely spread across the landscape. As a result, transit just doesn’t work for most people. Making transit systems work for more people would require using more small-box transit: small buses, vans, and so forth. Instead, many transit agencies want to emphasize big-box transit: huge buses, railcars, and trains. This just shows how out of touch transit agency leaders are with the people they are supposed to serve. Randal O’Toole directs the Transportation Policy Center at the Independence Institute, a free market think tank in Denver. A version of this article originally appeared in his blog,TheAntiplanner. The transit industry claims that transit saves people money. But the truth is that, for most people, it costs a lot less to drive than to ride transit. Public transit is the most heavily subsidized form of transportation in the United States, with subsidies per passenger mile that are 50 to 100 times greater than subsidies to driving. But people who use transit are only dimly aware of the subsidies. Even without counting the subsidies, most people don’t ride transit partly because the alternatives, including driving, cost so much less. The 2015 National Transit Database shows that people pay an average of 28 cents per passenger mile to ride transit. To compare this cost with driving, the American Public Transportation Association uses American Automobile Association calculations of the cost of driving, which show an average cost of about 57 cents a mile for medium-sized cars. So it seems like a no-brainer to conclude that transit saves money. AAA, however, assumes that everyone buys cars when they are brand new, pays full financing charges, and then replaces their cars every five years. That may be the way some people buy cars, but most cars last far longer than five years. According to the latest data, the average age of cars on the road is 11.6 years, which means cars last an average of 23 years. The AAA numbers fail to account for 78 percent of a car’s lifespan, during which time monthly payments and finance charges may be irrelevant. If you have a car, no matter how old it is, you only pay the variable cost whenever you drive it on any particular trip. According to the AAA data, that variable cost–fuel, maintenance, and tires–averages less than 15 cents a mile, and would be even lower if you had a more fuel-efficient car. So right there you are saving at least 13 cents a mile over transit. If you don’t live alone, you probably often drive with a passenger. That cuts your cost per passenger mile in half. Transit makes no sense if you and one or more other people in your household regularly travel together. If you don’t have a car and live alone, transit might cost less than buying a brand-new car. But what about buying a used car? If you spend, say, $5,000 on a used car instead of $25,000 on a new one, then your depreciation is less than $1,000 a year instead of the $3,759 calculated by AAA. Insurance on a used car costs a lot less than a new one. If you pay cash for it, you save the $683 in annual finance charges calculated by AAA. AAA also estimates taxes, license, and registration fees of $687 a year; in Oregon, which has no sales tax, it’s only about $40. But not everyone lives in Oregon. Counting the higher number for taxes and fees, but lower numbers for insurance and depreciation, annual fixed costs might be around $2,500 a year. If you drive 15,000 miles a year, that’s less than 17 cents a mile. Add the fixed costs of 15 cents a mile and the cost of driving your car each mile is slightly more than the cost of riding transit. But you could have saved money by buying a more fuel-efficient car, an older model that costs less than $5,000, getting basic insurance instead of full comprehensive coverage, or any of a number of other ways. Most importantly, if you have a passenger in your car at least some of the time, the cost per passenger mile quickly drops below the cost of riding transit. Bottom line: If you already have a car, the variable cost of taking your car on any particular trip will be far less than the cost of riding transit. If you don’t already have a car, it is easy to find ways to buy a car so that, even including the fixed costs, driving costs less than transit–which explains why 92 percent of American households have cars. Many people buy their first car because they need it to do something that transit can’t do. But, once they own it, the variable cost of driving is so low that they use it on trips that could have been taken by transit. That’s the basic story of transit decline in the 20th century. This doesn’t even consider the alternative of cycling, which costs less than either driving or transit, but in many cases is faster than taking transit (and sometimes faster than driving). Driving is still the mode of choice for the vast majority of Americans, but the low cost of cycling helps explain why the American Community Survey found that the number of people cycling to work grew by more than 21 percent between 2010 and 2015, but the number of people taking transit grew by less than 15 percent. Cycling and walking, not transit, are fast becoming the modes of choice for people without cars. Compared with the aura of security offered by riding inside of an automobile, many people avoid transit because they feel vulnerable and threatened by other riders. Crime, sexual harassment, and other invasions of privacy are common on metro systems throughout the world. Sexual harassment is especially bad on Tokyo subways, and a survey of 600 women transit riders in Paris found that 100 percent of them reported having been sexually harassed. Such harassment often depends on the anonymity that comes with extreme crowding, but most American transit systems don’t get that crowded precisely because Americans won’t accept the invasions of personal space required for such crush conditions. Still, there are numerous complaints of sexual harassment on the New York City subway. Crime is rapidly rising on the DC Metro as well. Crime, including thefts of smart phones, as well as violent crime, can be a big problem on light rail, partly because there is rarely anyone aboard to keep vehicles secure. Bus drivers presumably provide a modest deterrent to crime, but still there is the problem of bus-stop crime. Some researchers argue that transit doesn’t really increase crime near transit stations. But for potential transit riders, perception trumps reality. A woman may only have to suffer one or two experiences with groping or other forms of sexual harassment before she decides to never ride transit again. A man who is beaten and robbed of his coat because the coat happened to match a particular gang’s colors is also going to avoid transit. Some transit systems have designated women-only cars to protect women from harassment, but results have been mixed. Short of putting a guard on every bus and railcar, the issue of transit security cannot be easily solved. Housing, jobs, and other destinations are so diffused throughout American urban areas that they don’t generate the large numbers of people moving from one point to another that mass transit systems need to work. “Transit worked when American cities were denser,” is the mantra of today’s urban planners. “If we can increase their densities, transit will work again.” Reality is a lot more complicated, and that reality explains why transit can’t work in American urban areas even if their densities increase. From about 1880 to 1913, transit and cities co-evolved thanks to new technologies that benefited both. The same steam engines that powered commuter and early rapid transit trains also powered downtown factories. The same Bessemer steel that made the rails that streetcars and urban trains rolled upon also provided the structural beams that allowed construction of skyscrapers. The same electric motors that moved electric streetcars also powered electric elevators that gave people quick access to the upper floors of those skyscrapers. These technologies created monocentric cities by concentrating jobs in urban centers surrounded by residential areas that fed into the centers on transit. Never before in history had cities been like this, yet people today still imagine that cities ought to be monocentric, a myth that drives too much bad policy. This was transit’s Golden Age, but it was far from perfect. Transit was too expensive for unskilled workers, so they had to live in high-density tenements located within walking distance of downtown factories. To make a profit, rapid transit and streetcar operators used just enough vehicles to carry people but not enough to give them breathing room, at least at rush hour. Many transit lines had been built from the profits of the real estate developments they accessed, and while fares covered operating costs they were insufficient to rehabilitate these lines as they wore out. Urban and transit evolution parted ways in 1913, when Henry Ford built the first moving assembly line to make his Model Ts. Cheap cars were an obvious threat to transit, but a bigger threat was less visible: unlike steam-powered, belt-driven factories, moving assembly lines required lots of land, so factories moved to the suburbs. When the suburbs refused to be annexed to the cities, monocentric cities became polycentric urban areas. At least through the 1970s, urban planners and central city officials pretended their cities were still monocentric, and they wrote numerous downtown plans, urban renewal plans, transit plans, commuter-tax plans, and other plans designed to maintain the preeminence of downtown. The construction of the San Francisco BART and Washington Metro systems were among these plans, but were as doomed to fail as all the others. As both jobs and people left city centers after World War II, most major central cities began to lose population even as their suburbs grew. Since 1950, Buffalo, Cleveland, Detroit, Pittsburgh, and St. Louis have all lost more than half their populations. Cincinnati lost 41 percent; Baltimore 35 percent; Boston and Minneapolis 30 percent; Washington 29 percent; Chicago 25 percent; St. Paul 13 percent; San Francisco and Oakland, 12 percent. Except in New York, one of the few major central cities that had more people in 2000 than 1950, this decentralization greatly reduced transit’s effectiveness. By the 1980s, planners began to realize that urban areas had become polycentric, and today polycentricity is a fundamental part of the New Urbanism. Too late: cities had changed again with the decline of manufacturing jobs and the growth of service jobs. In 1920, nearly 40 percent of all American jobs were manufacturing, and there was one-and-a-third service jobs per manufacturing job. Today, less than 10 percent of jobs are manufacturing, and there are ten service jobs for every manufacturing job. Even if they weren’t in city centers, manufacturing jobs were at least concentrated. But service jobs in such fields as health care, education, wholesale and retail trade, and utilities, were diffused throughout urban areas. As noted in Reason #2, less than 30 percent of urban jobs today are located in downtowns or regional or town centers. Other things once concentrated in downtowns, such as shopping, churches, and theaters, also became diffused. These trends had the least impact on New York, but even in the New York urban area (which includes suburbs in northern New Jersey, southwest Connecticut, and New York state), as opposed to the city itself, transit is pretty marginal. While transit carries 57 percent of New York City commuters to work, it carries just 14 percent of suburban New York commuters. The diffusion of jobs and other destinations throughout an urban area returned cities to be more what they were like for thousands of years before the late nineteenth century. Simply increasing population densities, as regional governments in California, Oregon, and Washington have done, doesn’t help because those jobs and other destinations remain too diffuse for transit to work for any but a small minority of the population. These changes are not only irreversible, there is no reason why we should want to reverse them. COST Commentary: This posting uses the very appropriate title the Forbes’ article below was recently published with. COST was not directly involved but we certainly agree with it. The author did not communicate with COST but the article includes a ridership chart which is from a recent COST posting on this web site. Another recent COST posting, Don’t Waste Money Subsidizing Outdated, Ineffective Light Rail refers to a previous article by this author who is a Forbes contributor, traveling the country to write a book, came to Austin and reviewed MetroRail. The Austin Statesman published an article by Ben Wear and the Austin Business Journal also published an article by Michael Theis highlighting this Forbes article. This article’s capital costs for Metrorail are the standard Cap Metro deceptive, incomplete figures which are mush less than the actual costs and he did not have the data to comment on the fact that Cap Metro’s MetroRail annual operating costs started at about 5 times the cost promised voters in 2004 and are now more than double, and increasing rapidly, that high starting cost. Cap Metro is spending more than $80 million to increase the frequency of MetroRail train trips. This will likely increase the taxpayer subsidies for each rider which is more than $20 per trip or $40 per day for a weekday round trip commuter. This is more than a $10,000 (including Capital depreciation) average yearly taxpayer subsidy for each daily round-trip commuter. They could drive or take a “ride-hailing” vehicle for less. As noted in the article below, the vast majority of these rail riders are commuting to and from work, as there are few riders other than “peak” hours. Most of these riders can be served more cost-effectively, with reduced trip times, using express buses, especially when the current MoPac, and the planned 183, toll lanes are completed to provide free express bus lanes. The bottom line for this exorbitantly expensive, highly tax subsidized, transit mode is that its minuscule ridership provides no congestion reduction. Congestion is actually increased more than any relief and the high cost reduces the ability of Cap Metro to better serve Austin’s transit community. As a foundation principle transit and transportation are very much different issues. Transit provides trivial help to the 99% of Austin’s daily passenger miles which are traveled on the roads. On the other hand, effective road systems can provide significant help to transit riders by reducing their travel time. On average, public transit riders take about twice as long for work commuting in the U.S. as private vehicle passengers on roads. The recent tradition of public transit planners is to base transit on the primary objective of providing transportation alternatives which convince people to abandon private vehicles and use transit. This has failed in all cities similar to Austin, as has the related objective of coercing people to live in higher density to promote public transit. This misguided density emphasis has actually resulted is higher, less affordable housing costs. We must not base transportation and land use planning on self-serving or ideological ideals but on the decisions of the vast majority of free citizens who have considered all factors and decided the most effective way to serve their mobility needs and meet their quality-of-life objectives. Coercing people to increase density is directly contradictory to reducing congestion. There is a simple relationship: the higher the people density, the greater the congestion on the roads and, generally, this produces higher housing costs. There is a strong misconception in some people that roads are highly subsidized as public transit is. This is another myth: Subsidies to auto driving averaged 1.5 cents a passenger mile in 2014, up from a penny in earlier years due to Congress overspending the Highway Trust Fund and having to replenish it out of general funds. Subsidies to transit averaged 78 cents per passenger mile in 2014; 52 times the per mile subsidy for auto driving. To better serve the greater-good of transit riders and private vehicle users, transit planning must be based on the primary objective of providing improved, cost-effective bus transit for the widest, reasonable population of citizens who have no other choice but transit. This objective must displace the current primary transit objectives in Austin. This objective cannot be achieved with ineffective, inflexible urban rail transit, the least cost-effective of current transit modes. Nor, can this objective be achieved with fixed guideway rail or bus transit. Fixed guideways are exorbitantly high cost and remove private vehicle lanes in limited space. This is contrary to people’s choices of transportation and will result in increased congestion, degrading central Austin mobility and citizens’ desirability. We are already witnessing this with Austin’s implementation of the ‘Envision Austin’ plan with its many misguided strategies. There is another simple relationship: the greater the mobility, the greater the quality of life. To enhance overall road mobility and its very positive transit impact, road funding must be in reasonable proportion to road passenger miles traveled and not greatly less than proportionate funds for travel on transit, bicycles, or pedestrian accommodations. Austin, TX–Last Saturday morning, while stumbling upon an Austin rail station, I was able to imagine at micro level what it must be like to visit one of China’s ghost cities. 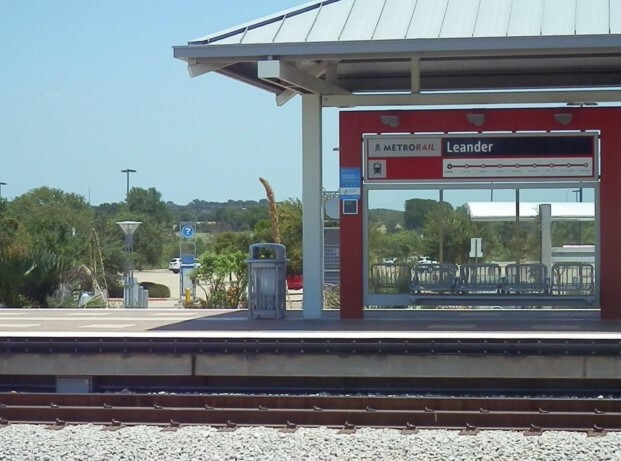 I was in Leander, an Austin suburb that has the northernmost stop on the metro area’s commuter rail system, when I spotted a multi-acre station plopped across what was essentially a rural area. After parking in the empty lot, I got out and walked around, to find a clean, well-landscaped facility that had not one human in sight. The info center was locked, the train platforms were empty, and no trains arrived. There was even a computerized voice humming out service updates over the platform speakers, to an absent audience. In fairness, the station was closed that day until 4pm. But that just begged the question—why would a train station be closed all Saturday morning and afternoon in a major metro area? Meanwhile, the platform offered an unobstructed view of adjacent US-183, where, in the course of 10 minutes, dozens of cars passed by in each direction. This stark contrast summarized the idiocy that has become rail transit policy in urban America. Many U.S. cities sprawled out after World War I, when automobiles became mainstream technology, and the government exacerbated these patterns in following decades through urban renewal, restrictive zoning, minimum parking requirements and road subsidies. A number of these cities—including Phoenix, Houston, Dallas, Portland, Los Angeles, Baltimore and Cleveland—tried reversing their past land use mistakes by building rail systems, which would supposedly concentrate development and bolster transit ridership. But closer analysis suggests this hasn’t worked, and anyone familiar with those cities understands why. They were built to accommodate private automobiles, meaning people can drive within them directly to and from their destinations. No one there with financial options is going to instead take rail transit that follows a fixed route, arrives every 15 minutes, and makes multiple stops–no matter how much of said transit is built. It hasn’t helped that these transit systems are run by monopolistic government agencies, meaning they suffer from misappropriations, delays, cost overruns and poorly planned routes, including trains that, in some cases, run well into the countryside before stopping in podunk towns. Unfortunately, Austin’s rail embodies all these problems, standing as perhaps America’s leading rail transit failure. The desire for rail transit in Austin dates back to the 1970s, when the city’s fast growth spurred discussions among urbanists and environmentalists about possible mode changes. These hopes were squashed in 2000, when a ballot proposal that would have sent light rail up the well-trafficked Guadalupe Street was narrowly defeated. But rail proponents received their bone–kind of–a decade later, when Capitol Metro, the Austin public transit provider, opened MetroRail. The 32-mile line was built along existing freight tracks that began downtown, moved north through mostly residential neighborhoods, and into some commuter suburbs. The project opened amid a storm of controversy, thanks to construction issues that escalated the final tab from $90 million to $148 million. In the opening months, the line received just 800 riders per weekday. This has since risen to 2,900 passenger trips per weekday, or about 1,500 riders, but that still is just .0007% of the metro population, which sits above 2 million. The line accounts for 2.6% of Austin’s transit ridership, while using 8.5% of the annual operating expenses for transit. Even worse, this is actually hurting transit availability. MetroRail’s high capital costs depleted the agency’s reserves, leading, noted Skaggs, to service cuts on bus lines, which are widely considered a more cost-effective choice. This has reduced Austin’s overall transit ridership, just like in Texas’ other major cities (two of which also have rail transit systems). That is all the more amazing given these are some of America’s fastest-growing cities by population. But one does not need numbers to observe, at street level, the system’s obvious failures. After happening upon the empty Leander station on Saturday, I ventured this week to other stations around downtown and the interior neighborhoods. Outside of morning and evening rush hour, they were either empty or almost empty of passengers, and were divorced from any of the city’s major job and population centers. The further north along the line I rode, the more obvious it became that this really was a train to nowhere–32 miles of expensive and dated rail infrastructure that had little to no passengers or surrounding development. AURA is in favor of high ridership light rail that makes use of our best transit corridors. We’re not in favor of speculative, low-ridership lines that are intended to spur development…Currently, Cap Metro’s approach is to spend more money on the Red Line to make it more frequent and attract more riders. While that may initially seem like a noble goal, in fact the Red Line suffers from a fatal flaw: the route. AURA would prefer to see our limited Cap Metro dollars go into creating a high frequency bus network. 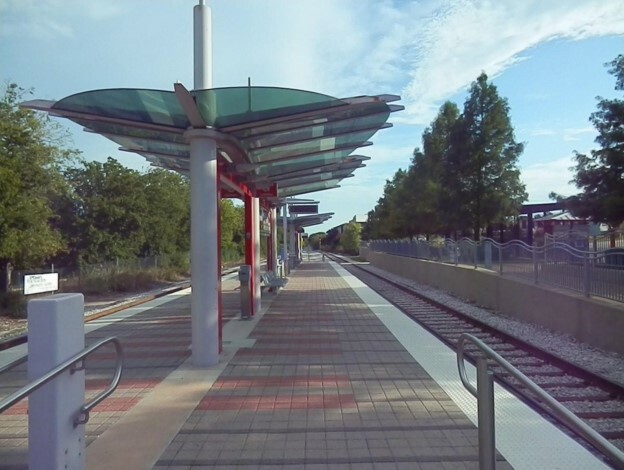 There have been further efforts to build rail transit in Austin, with various groups aiming for a new, more centrally-located line. In 2014, another $600 million rail proposal was floated before voters, and packaged with prospective road upgrades. But voters, clearly cold to the rail transit idea by then, defeated it by a 14 percentage point margin. There are similar attempts to get rail onto the ballot this year. Perhaps one day rail transit will be practical in fast-growing, fast-densifying Austin, and it’s just a matter, as the proponents say, of having the right infrastructure along the right route. But a combination of academic analysis and basic observation still encourages skepticism. Data provided by the Federal Transit Administration shows that even the much-ballyhooed systems in Minneapolis, Portland, and Charlotte, while better-located and thus not as bad as Austin, are also funded by high per-trip subsidies. And this data doesn’t account for their capital costs, which for rail transit are far more expensive than for roads, tabbing in at $70 million per mile. At the same time, there are private transit solutions within the ridesharing and bus industries that are profitable, largely because, rather than imitating the fixed-route concept, they’ve tapped into the best things about cars, by offering flexibility and on-site demand. These innovations are bound to improve as driverless cars enter the mix, and Austin would be smart to encourage them, rather than banning them, as it recently did with Uber. But if Austin wants to keep its inter-urban and suburban transit stagnant, wasteful and under-performing, well, it has a formula for that too–build rail transit, and have the government run it. You are currently browsing the Jim Skaggs’ Transportation Comments blog archives.